It is a wonderful way to meet new friends from all different countries and cultures.We have 10 different weekly cabin charter routes with guaranteed departures. The cabin charters are operated on traditionally built wooden yachts. They are crewed motor sailors, ranging from 18 m to 35 m.The capacities of these yachts vary from 4 to 12 double cabins with private sanitary facilities and they are adequate to accommodate 8 to 24 persons on each cruise. 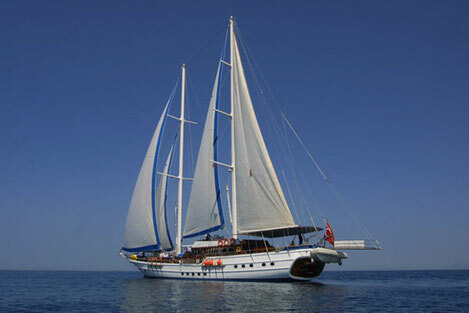 They all meet standard security requirements and are equipped with navigation, sailing and cooking facilities. The itineraries give you the opportunity to combine the land tours- historical towns- and the most beautiful natural bays to swim around. With our Traditional Wooden Gulets you will find it easy to enter each bay and port that Cruise Ships cannot. Swimming right off the gulet is a great feeling without having to wait for a queue for an undersized swimming pool. Apart from swimming you will find the chance to explore the beautiful islands and coasts full of small and lovely towns with great historical monuments. Having only 36 people the most (36 for mega yacht B&B, 8-20 for gulets) around you, you will get to know your fellow passengers better right from the first day and no doubt that you will be on the first name basis both with the crew and the passengers in a few days. Cabin Charters give you the unique chance to meet people from all around the globe that you cannot experience anywhere else. Imagine having Americans, French, Germans, Italians, British, Australians, Turkish, Greeks, Russians and etc. sitting altogether at one table at a cosy environment. Cabin Charters are the only opportunity to experience that sincerity among the varied nationalities. Even though you will not stay much inside your cabins, cabins are comfortable and well equipped. 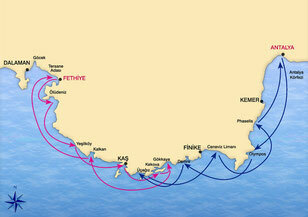 Cabin Charters are being made with gulets that have 5 to 16 cabins. 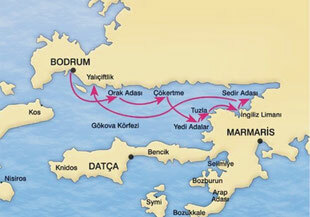 All of your meals will be served on board which are a part of tasty Turkish Cuisine. Mostly these are going to be the unforgettable moments of laughing and having fun altogether with your new friends. Every day the number of people that recognise the tags "Cabin Charter" and "Traditional Wooden Gulets" is growing. These tags used to be a dream for some in the past and Medsail Holiday made it reality for many. Be one of our "Blue Cruise" guests and join us, so that you too can live this experience with Medsail Holiday who made it well-known in all over the world. 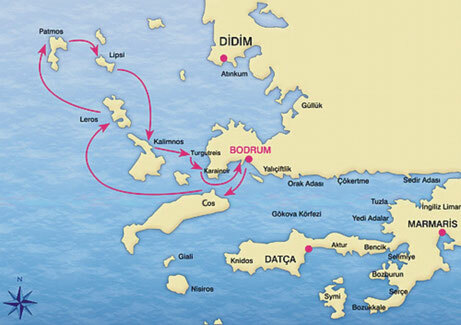 Every Friday, Saturday, Sunday and Monday we have guaranteed departure "Cabin Charters" from Bodrum, Marmaris, Kusadasi, Gocek and Mykonos. 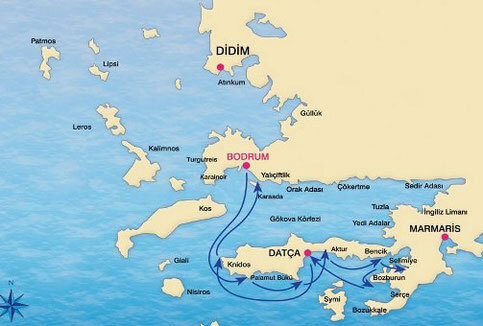 Cabin Charter is a great way to enjoy the beautiful wonders of the Turkish Coast line and the Greek Islands. 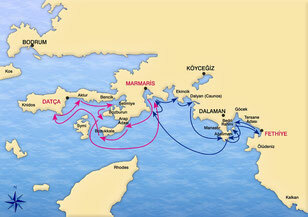 You may choose to enjoy the cruise on your own, with friends or family and the number of cabins is up to you. 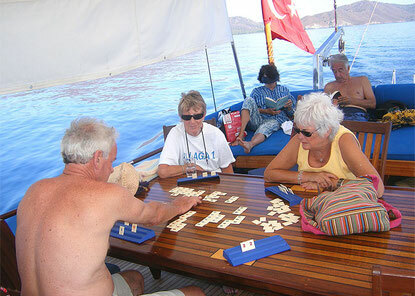 You don t have to get a large a group together to rent a private yacht for a yachting holiday. 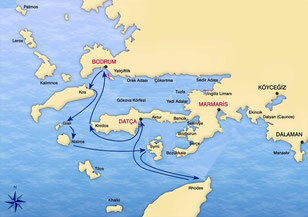 You have the opportunity to enjoy a "Blue Voyage" together with a group of sea-lovers from all around the globe.